Our church usually holds a Sunday lunch once a month after a morning service. An example menu would be roast beef with roasted and boiled potatoes and vegetables followed by trifle. 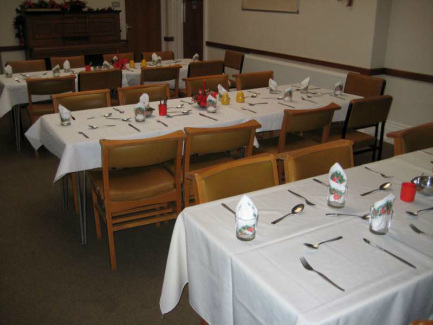 We also hold occasional buffets for special occasions as well as lunches to follow the community event. Nant Coch appears on the national food hygiene rating website. The Church has been awarded the highest rating, 5 - very good, by Newport City Council. Tables ready for a Church lunch.